The attacks in Paris on 13 November 2015, the deadliest in Europe for a decade, will undoubtedly contribute to major changes in the socio-political climate in the European Union and affect the future of the European integration process. Especially since the attacks occurred at a time when European countries are facing a huge immigration crisis from the regions of North Africa and the Middle East. The dramatic events that have taken place in Paris also have a clear geopolitical dimension, which in the long run may prove to be much more important than the relatively short-term strategic implications. The Paris attacks are a confirmation of the thesis that the lack of any decisive action on the part of the international community against the so-called Islamic State (ISIS) has strengthened this organization and contributed to its territorial and ideological expansion. The sluggish operation of the US-led international military coalition, lasting almost a year and a half, has not contributed to any significant weakening of the forces of the caliphate. Similarly, the Turkish military campaign (allegedly ‘anti-terrorist’), launched during the summer of 2015, is in fact aimed mainly against the Kurdistan Workers Party and its twin Syrian structures, and not ISIS. The attacks in Paris, carried out by an ISIS cell, occurred at a time when the international context of the five-year conflict in Syria began to alter somewhat. The war in this country is no longer a classic civil war, but a proxy war, not only between the rival regional powers (Iran and Saudi Arabia), but also between the powers outside the region, particularly the United States and the Russian Federation. Russia’s direct military intervention in Syria at the end of September 2015 (taking the side of the government in Damascus) led to a further geopolitical escalation in the Levant. Although portrayed as a struggle against Islamic extremists and terrorists, including the caliphate, the Russian military operation is essentially to support the tottering Syrian regime. Thus, Moscow clearly stands alongside Iran and its Shiite allies in the region: Iraq, the Lebanese Hezbollah, and even Yemeni Houti. For the main regional Sunni, anti-Shia and anti-Iran players, such as Saudi Arabia, Turkey and Qatar, Russian involvement in Syria meant the actual end of the dream of overthrowing President Bashar al-Assad’s regime. It was particularly painful for Turkey, for whom regime change in Damascus has been one of the most important axioms of its policy in the region. Russia’s actions in the Levant have posed a direct challenge and threat to the long-term interests of Turkey, so it is no wonder that Ankara has employed extremely tough rhetoric against Moscow and its Middle East policy. The shooting down of a Russian Su-24 bomber (which were perceived as violating Turkish airspace) by Turkish fighter jets on 24 November 2015 is a consequence of such an attitude. This event gave a new dynamic to the conflict in Syria, greatly exacerbating the competition of powers in the Middle East and raising the risk of ‘overflow’ of the conflict beyond the area of the Levant. Turkey’s decisive anti-Russian actions have taken place at a time when Moscow (which has been in a dispute over Russian-Ukrainian conflict with the West for more than a year) has found a common language with at least some of the Western countries, especially France. Following the attacks in Paris, the French authorities began to openly articulate the need for close cooperation with Russia in the fight against the caliphate. Especially since Russia has also recently suffered a severe loss at the hands of ISIS (the attack on a Russian airliner over the Sinai in October 2015). 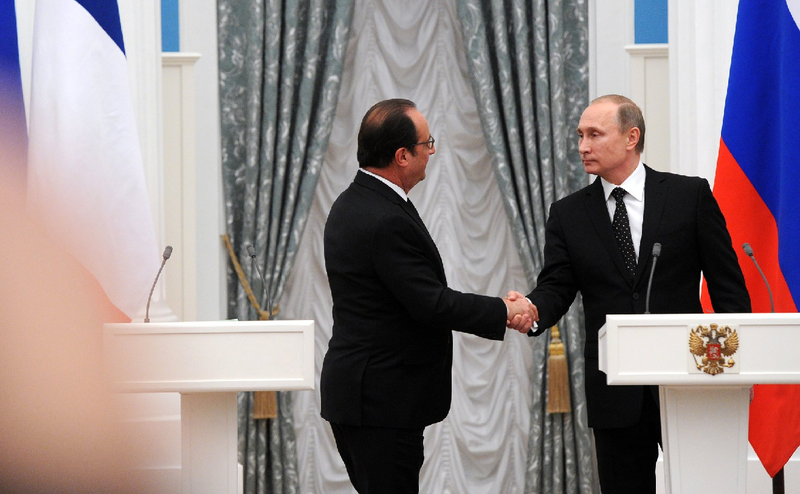 The French did not even rule out a discussion on the flagship demand of Moscow, i.e. making peace talks in Syria with Bashar al-Assad (which would de facto mean leaving Assad in power, at least for a while). A similar position was expressed in November 2015 by many other Western European countries (Belgium, Germany, Italy and even the UK). Prime minister David Cameron has openly stated the need to settle the conflict in Syria with the participation of the current government. In early December 2015 the RAF began open military actions against ISIS in Syria, and London established a formal military dialogue with Moscow, formally in order to ‘avoid conflict situations and potential confrontation.’ In fact, these consultations have also had an important political dimension, concerning the arrangements relating to the future actions of both countries with regard to the Syrian issue. Turkey had high hopes for the G20 summit in Antalya (15-16 November 2015), expecting to find support for its ideas and strategies regarding Syria. The meeting that took place just two days after the attacks in Paris was a great disappointment for Turkey. Due to the soaring sense of threat from radical Islam in European countries, the main theme of the summit was to reinforce the fight against ISIS. Facing the common struggle against the caliphate, Russia’s cool relations with the West began to warm up during the summit. This increasing mutual understanding and rapprochement between Russia and some countries of Western Europe over Syria, built around the main axis of the Russian narrative (maintaining the current Syrian regime), would mean fewer opportunities for Turkey to realize its strategic goals. The shooting down of a Russian aircraft was thus intended to display Moscow’s actions in Syria as irresponsible (the continuous violations of Turkey’s airspace), and openly confrontational (i.e. directed against a NATO member). The Alliance, however, has shown great care against Ankara’s game. Similarly, the European Union did not earlier accept Turkish narrative regarding the reasons for mass migration of Syrian refugees from Turkey to Europe (which, according to Turkey, was a consequence of al-Assad’s regime). The United States, somewhat in opposition to the actions of its main European allies, is still officially proclaiming the timeliness of the currents axiom associated with the departure of al-Assad’s regime. Already in October, through its regional allies (mainly Turkey, Qatar and Saudi Arabia), the Americans greatly intensified the process of providing Syrian rebels with technologically advanced weapons systems, mostly with guided anti-tank missiles launchers (ATGM – Anti-Tank Guided Missiles, primarily American BGM-71 ‘TOW’) and a large number of ammunition for those. The effect, the multiple use of ATGM in Syria, was immediately noticeable. In October of 2015 a six-fold increase was reported in the frequency of the use of ATGM by insurgents and jihadists (140 cases of use), compared to September (22 cases). The mass use of such weapons by rebels ruined the plans and intentions of the Syrian government forces. With the support of Russian planes, it was aiming to regain key areas in the provinces of Homs, Idlib and Latakia. Syrian mechanised columns, massacred by U.S. TOWs, which were in possession of the Syrian rebels, were not able to take advantage of the support provided by the Russian air force. In the middle of December 2015 the U.S. administration also announced it was sending to Syria (and Iraq) a few hundred special forces operatives, to assist the forces fighting against ISIS. From Russia’s perspective this decision is confrontational, and it was also made against the recent actions of Western European NATO countries. It cannot be ruled out that the intention of the White House is the deployment of U.S. Marines among the units of the anti-Assad opposition as ‘human shields’ to protect these formations from attacks by Russian air force. Regardless of this tactical context, the actions of Washington, however, fit in with the strategy of its regional Sunni allies (Turkey and the Arab countries of the Persian Gulf), which only consolidates the division of alliances in the region into the pro-Russian Shiites and pro-American Sunnis. The authentic, real fight against the caliphate is down by the wayside in such a reality. The relinquishment of efforts by the U.S. to overthrow President al-Assad, announced by the Secretary of State John Kerry during his meeting in Moscow with Russian Foreign Minister Lavrov, might be a sign of a potential revolution in Washington’s position towards the Syrian issue. The consequences of the current situation go far beyond the arena of the Middle East. Russia’s rapprochement with some Western countries, presented by the Kremlin as a pragmatic realization of the timeless task of combating the common enemy of Christian civilization, is carried out effectively at the expense of the long-term strategy of the West towards Moscow. This strategy has been built so far on the fragile consensus within the EU and NATO concerning the need for a common goal to restrain Russia’s aggressive actions in Eastern Europe, perceived as a direct threat to the security of the Euro-Atlantic region. Russia has fully exploited the soaring sense of threat from radical Islam in Western Europe, caused by the attacks in Paris and their consequences, and treated it as a pretext to actually break up the uniform western front. Russia has successfully introduced itself as an important and effective ally of the West in the fight against ISIS in the region of the Levant, which effectively destroyed the existing fragile unity of the Western countries and their consensus on the general direction of further policy towards Moscow. The first results of the Kremlin’s strategy can already be seen: the sanctions imposed on Russia after its annexation of the Crimea in 2014 have less and less chance of further prolongation. Not only key Western European players but even the Syrian opposition are speaking about the need for some form of inclusion of the regime in Damascus in negotiations to regulate the situation in Syria. 1. The West, especially European countries of the EU and NATO, must be aware that Russia is treating its commitment to Syria and the fight against ISIS in a cynical way. The aim of the Kremlin is not only to defend the regime of Bashar al-Assad, but also to regain the trust of the West under the pretext of combating the caliphate, and obtaining concessions for discretionary action in regions considered by Moscow as within its sphere of influence (i.e. the area broadly understood as post-Soviet: Ukraine, Transcaucasia, Central Asia). 2. Europe must avoid the temptation to use the ‘reset’ in relations with Russia, based solely on promises of Moscow concerning its involvement in the fight against the caliphate. In fact, the struggle against ISIS is not a priority for Russia’s activity in the Levant. From the Kremlin’s perspective one of the objectives of its involvement in the Middle East is distracting the West from vitally important strategic directions, such as Ukraine, Caucasus, Moldova, etc. Moreover, Russia does not have special strengths or advantages in the fight against the so-called Islamic State by use of which it could realistically support or reinforce the EU and NATO. In fact, it is not able to bring any significant added value to the conflict. 3. Western countries must also be aware that they are not allowed to take shortcuts and draw up a kind of tie-in transaction with Russia by combining the issue of relations with Moscow with the future of Ukraine and Georgia and the fight against terrorist threats. 4. The attacks in Paris have shown that the threat of ISIS is becoming greater and greater, therefore, a real fight must be undertaken. One should look everywhere for allies, regardless of the ideological and political prejudices. However, these actions must be clear, without resorting to agreements of dubious moral quality.